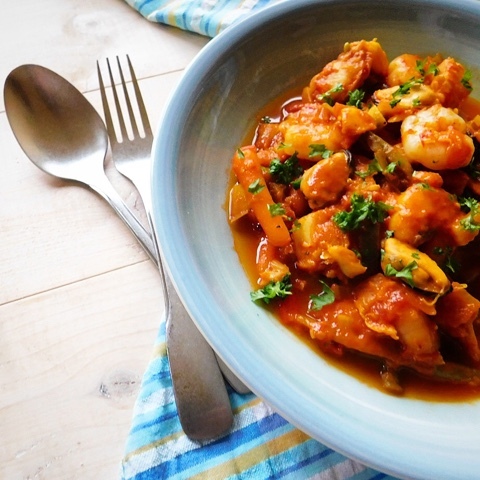 A traditional French Fish Stew made with a little help from the #PowerOfFrozen. Serve your Cod, Prawn and Mussel Bouillabaisse with a crusty baguette to mop up all the deliciously flavoured juices. I do hope that you are remembering that this Sunday - 26th March 2017 - is Mother's Day. I've got a wee something for my Mum and I'm hoping that Foodie Boy and Foodie Girl have likewise remembered about me! Traditionally children and young people who were in service (think Downtown Abbey!) were given a day off on the forth Sunday of Lent so they could visit their families or return to their "mother" church. The children would pick wild flowers along the way to place in the church or give to their mothers. Eventually, the religious tradition evolved into the more commercialised Mother's Day gift giving as we know it today. Iceland Foods asked me to come up with a three course meal that I would like to share with or make for my Mum for Mother's Day. Unfortunately I'm not going to see her on the 26th as she's around 120 miles away so she'll have to enjoy it in a virtual sense for now! I could have easily chosen the full three courses from the freezers in my local Iceland - but if I'd done that there wouldn't be a recipe to share! 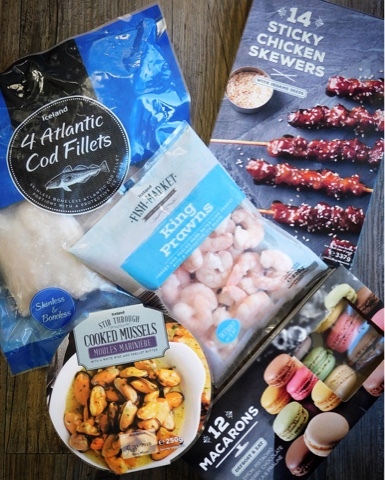 The taste, high quality and convenience of frozen food make it perfect for when you want to spend quality time with someone special and not be stuck in the kitchen. 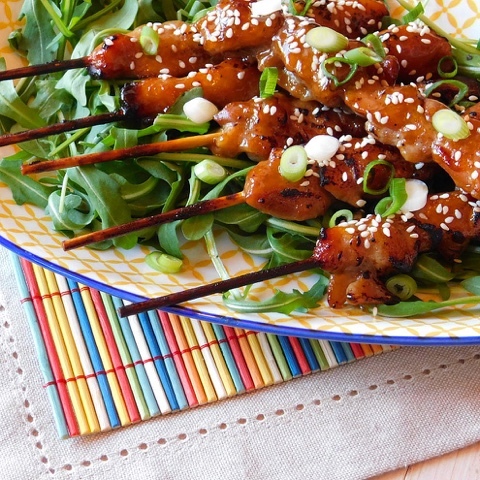 For starters I pondered over Aromatic Crispy Duck with Pancakes and Jumbo Tempura Prawns but settled for Sticky Chicken Skewers which I served up on a simple salad sprinkled with sesame seeds and spring onions. You'll find the recipe for my main dish of Cod, Prawn and Mussel Bouillabaisse below, which needs no more alongside than a chunk of crusty bread to mop up all the delicious juices. 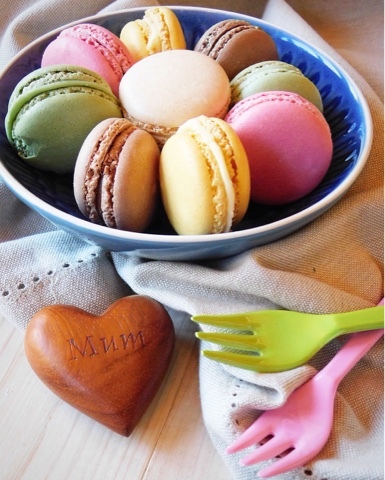 For dessert I opted for the colourful Macaron Selection which is fantastic value at only £3 for 12 (or buy two packs for £5 and build your own Macaron tower!) However, I should confess that this was probably more for my own taste than my Mum's and she would perhaps prefer something chocolately like Iceland's Belgian Chocolate Melt in the Middle Puddings, Luxury Pot Au Chocolat or Chocolate & Hazelnut Marquise. My Dad is allergic to shellfish hence Mussels and Prawns aren't something that my Mum would normally cook so I wanted to incorporate them into my recipe. Bouillabaisse is a classic French seafood stew and was traditionally made with whatever the fishermen hadn’t sold that morning. The distinctive flavours of a bouillabaisse broth include saffron, orange zest and fennel, however when it comes to the fish you can ring the changes to your own preference. I've used a trick picked up from the wonderful Nigel Slater to flavour the base of my broth using tinned anchovies. It works amazingly well and I promise you that even those who professs to dislike anchovies couldn't guess they were an ingredient but they really do add something special to the dish. Recent advice has seen the recommendation for 5 portions of fruit and vegetables a day increase to ten. 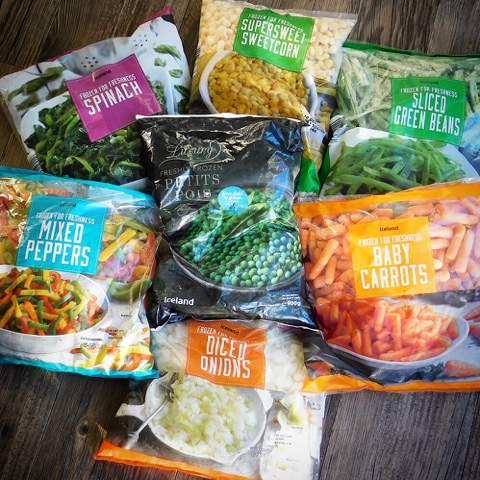 I'll put my hand up and admit that this is a real struggle for me although I am trying my best and the selection of frozen veg available at Iceland are helping me along the way (even picky daughter has given the baby carrots her seal of approval!). In this dish I used onions, peppers, carrots and green beans but just like the fish you can easily ring the changes and include your own particular favourites. That's the #PowerOfFrozen. Place a large casserole dish or heavy based pan on the hob over a medium heat. Pour in the oil from the tin of anchovies and once it is sizzling fry the onions, garlic and fennel for 5-7 minutes or until softened. Tip the anchovies into the casserole and allow them to dissolve into a mushy paste before adding the peppers, orange zest and juice, tinned tomatoes and tomato puree. Season with the saffron, cayenne, star anise and black pepper. Put on the lid and simmer gently for 20 minutes. Add the carrots and green beans and simmer for a further 10 minutes before you add the cubed cod, prawns and mussels. Cook for a further 5 minutes or until the cod is opaque and tender. Remember to remove the star anise before serving. Serving suggestion - serve in a shallow bowl sprinkled with chopped parsley and with griddled slices of French Bread spread with the white wine and shallot butter from the Moules Mariniere. Awww, can I send your Mum some big love too? Here's hoping her 2017 is a lot more fun than last year! Thanks Jane she's doing really well and most of the invasive stuff is now over. Those Moules Mariniere are seriously good! I hope your mum is doing well. This is a lovely recipe for her and mopping up the juice with bread sounds divine. She's doing really well thanks Kate. Tasty cooking juices and crusty bread are a match made in heaven. Bouillabaisse. Sadly, this menu item is very rarely seen on British soil. No choice but to make it at home, eh? Yours looks divine! Now you come to mention it I've probably only ever had it on holiday. Well worth making yourself on UK soil. A lovely recipe and great to know there's so much scope with frozen food. Best wishes to your mum. I really don't know what I'd do without my freezer. I have a wee one in the kitchen and another huge chest freezer in my garage. This brings back lots of memories - I eat a lot of fish in France as I like my meat well done, and the French generally don't . I love your idea of using anchovies to flavour the sauce! Isn't it wonderful how food can evoke memories. I like my meat bloody so French Steak is perfect for me. The anchovy tip from Nigel is such a good one. I LOVE seafood! This looks so flavorful and tasty. YUM. My Mum loves it too but normally has to abstain because of my Dad so I thought this would be the perfect treat. Oh Boy! Your playing my song with this beautiful recipe. I can almost taste it now. Believe you me - it tastes good! This looks delicious! I hope you and your mom have a wonderful Mother's Day! Thank you! Alas we didn't spend it together but will catch up soon. That looks delicious. I am so impressed at the quality in Iceland, they have really transformed themselves over the last few years. Thanks for sharing the little history on Mother's Day! Interesting read. Both the skewers and the Bouillabaisse look amazing. Too bad your mom is so far away but I hope you get a chance to make it for her someday! Looks great! 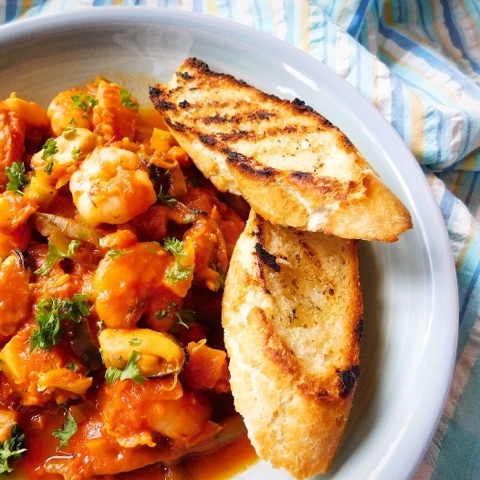 This fish stew looks absolutely AMAZING! Such a lovely treat for your Mum. I really want to try the sticky chicken skewers with sesame seeds, so will get them next time I'm in Iceland along with the Macarons. 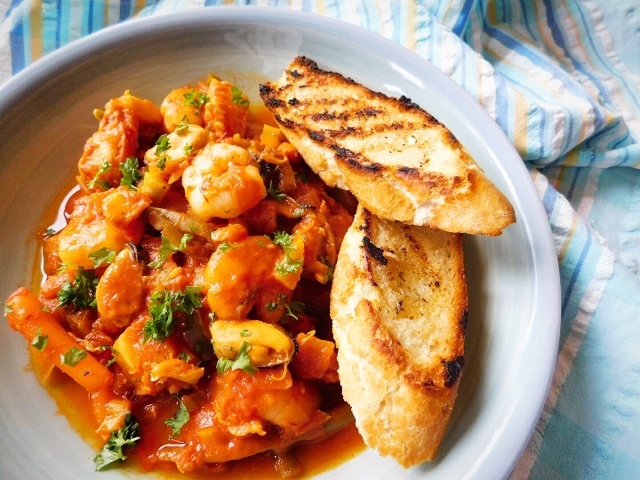 Oh my gosh I love, love, love Bouillabaisse and I am so desperate to try your version. It is a seriously good dish Bintu. Thanks Jenny - I love it too. Thanks for hosting Kirsty, it is indeed delicious. The Anchovy tip is such a good one. Nigel uses them in lots of his recipes.